Officials in Florida's Key West and popular Caribbean tourist islands ordered people to evacuate on Tuesday as Irma, a "potentially catastrophic" Category Five hurricane, was set to make landfall. The monster hurricane coming on the heels of Harvey, which struck Texas and Louisiana late last month, is expected to hit a string of Caribbean islands including Guadeloupe late Tuesday before heading on to Haiti and Florida. The Miami-based National Hurricane Center said Irma had strengthened to the most powerful Category Five, packing sustained winds of 300 kilometers (185 miles) per hour. The front was moving west at 15 miles per hour, and is expected to dump up to 50 centimeters (20 inches) of rain in some areas when it hits land. "These rainfall amounts may cause life-threatening flash floods and mudslides," the NHC warned, calling the storm "potentially catastrophic" and urging that "preparations should be rushed to completion" in the region. The United Nations program UNICEF warned that Hurricane Irma may affect hundreds of thousands of children and their families in the Caribbean, urging governments in the region to help protect children from the storm. Schools and government offices in French overseas territory Guadeloupe have been ordered shut, while hospitals are stocking up on medicines, food and drinking water. People living on shorelines will be moved to safety, authorities said. The popular holiday destinations of Saint Barthelemy and Saint Martin - a French territory and a French-Dutch split island respectively - are expected to be especially hard hit. Local authorities ordered people living close to the water and other easily flooded areas to take shelter in safe, elevated zones. "Their life is in danger if they don't take shelter quickly in secured areas," said Prefect Anne Laubies. The Dutch defense minister said soldiers arrived in the Dutch part of Saint Martin on Monday and two vessels, including one equipped with a helicopter, were in place to help. The ordered evacuation of 11,000 people living in affected areas on both islands was under way, while churches have also mobilized to help. In Guadeloupe, families began filing into shelters with their children, along with tourists. "We came here to protect our little two-year-old boy," said a tourist who only gave his first name Ludovic. "We hadn't prepared for this disaster scenario. Our rental home is beautiful but it only has bay windows." In Shada, a shantytown in Cap-Haitien, many were unprepared, unaware a monster storm was looming. "I didn't know a hurricane was coming because we don't get electricity here so we don't get the news," said Jacquie Pierre. "I am scared, not just for my life but that of my children and for all of us Haitians; we're like a big family." Irma's precise path remains unclear, but projections suggest it will head towards the British Virgin Islands before reaching the US territory of Puerto Rico late Wednesday, before passing over the Dominican Republic, Haiti and the Bahamas. Florida expects the greatest danger from Friday night through Monday. President Donald Trump declared states of emergency in Florida, Puerto Rico and the US Virgin Islands, authorizing federal funding to help local authorities respond. Florida Governor Rick Scott said Irma posed "a severe threat to the entire state" barely a week after Harvey claimed at least 42 lives. Tourists in the popular Key West islands were packing their bags on a mandatory evacuation order and were due to begin leaving at sunrise on Wednesday, with a similar order for residents due to follow. "We're emphatically telling people you must evacuate, you cannot afford to stay on an island with a Category 5 hurricane coming at you," said Monroe County emergency operations center director Martin Senterfitt. There were long queues as people rushed to get batteries, bottled water, groceries and fuel, while many cut trees around their homes and sought to tie down objects and seal up their windows. 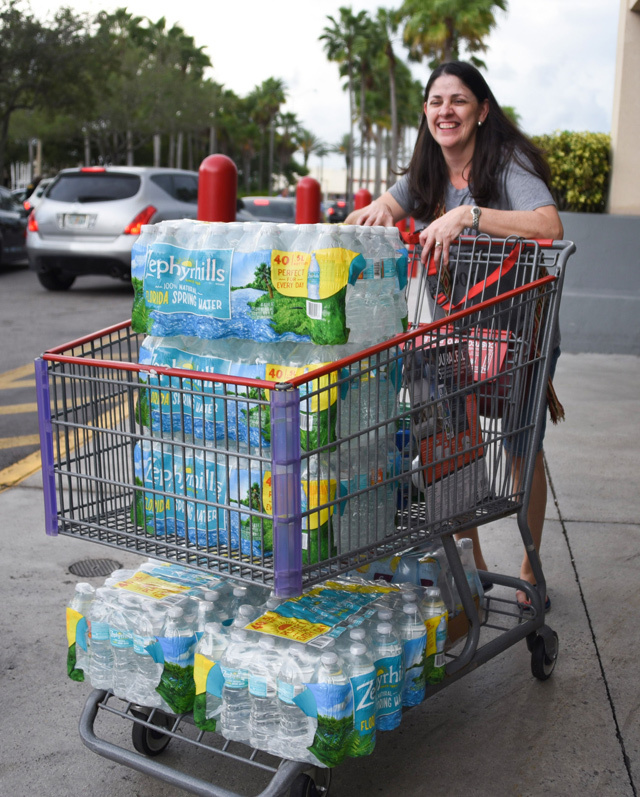 In a crowded supermarket in Miami Beach where people were scrambling to buy provisions, it was already difficult to find some basic supplies, like water. "It's because people go crazy and buy up everything," 81-year-old resident Gladys Bosque told AFP. 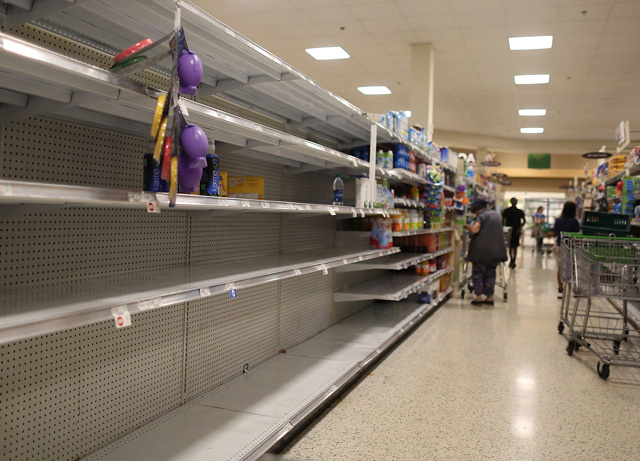 "There's no water, no milk, there are very few cans - and no cat food." Category Five hurricanes are rare. They can tear off roofing, shatter windows, uproot palm trees and turn them into projectiles that can kill people. 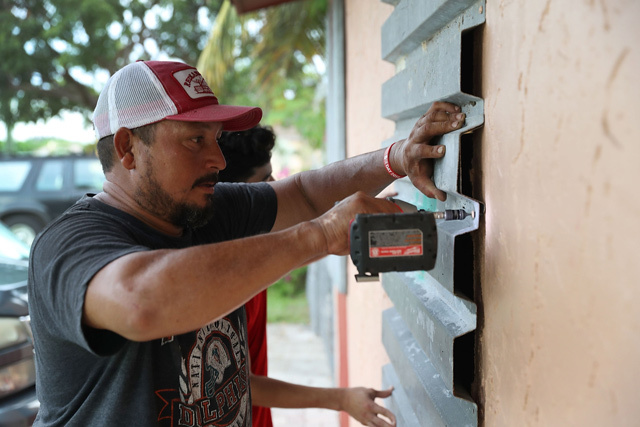 In Puerto Rico, Governor Ricardo Rossello activated the National Guard and announced the opening of storm shelters able to house up to 62,000 people. A US aircraft carrier with a field hospital and dozens of aircraft able to conduct rescue or supply missions have been positioned in the area, according to Alejandro de la Campa of the Caribbean division of the US Federal Emergency Management Agency (FEMA). Sheilyn Rodriguez of Rio Grande, 33, said "I really am scared for my kid," a son who is nine. She was stocking up on batteries, canned goods and ice in case the power goes out.